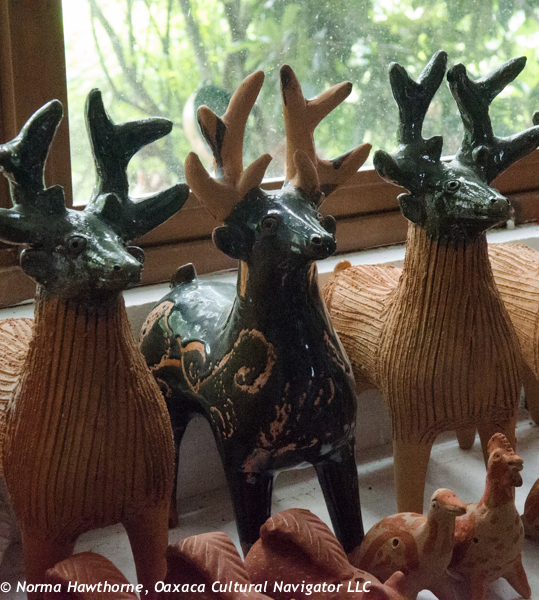 Overlooking the Oaxaca valley at the top of the Santa Maria Atzompa hill is the pottery studio of Angelica Delfina Vasquez Cruz. 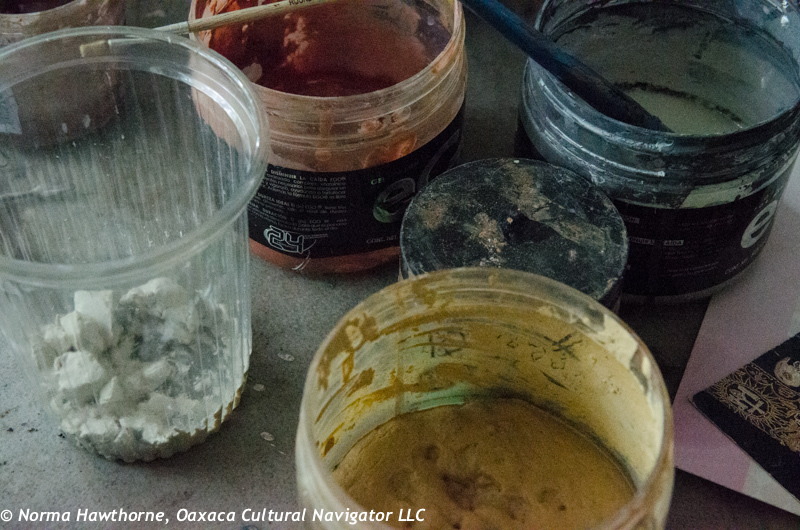 She has been recognized as one of the great masters of Oaxaca folk art by Fomento Cultural Banamex, the foundation that recognizes the best crafts people of Mexico. We visited Angelica at her home and studio after taking a guided visit around Monte Alban, led by our excellent licensed tour guide Rene Cabrera Arroyo who is very knowledgeable and gives an in-depth discussion of the archeological site. 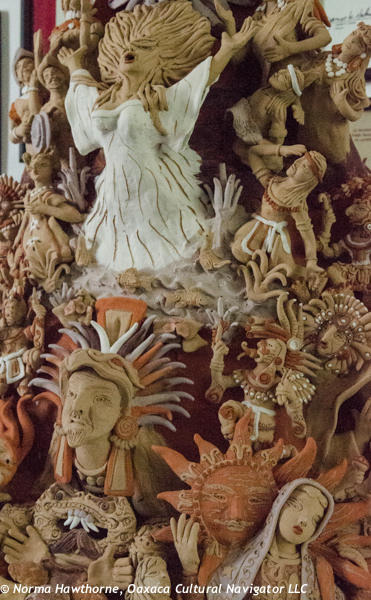 Atzompa was a satellite city of Monte Alban and it’s artisans provided the clay vessels and altar pieces for the Zapotec religious and political leaders. The skill to learn the traditional craft is passed from generation to generation and Angelica learned from her father, who learned from his father before him. Helping her today is her daughter (above left), an artist in her own right. 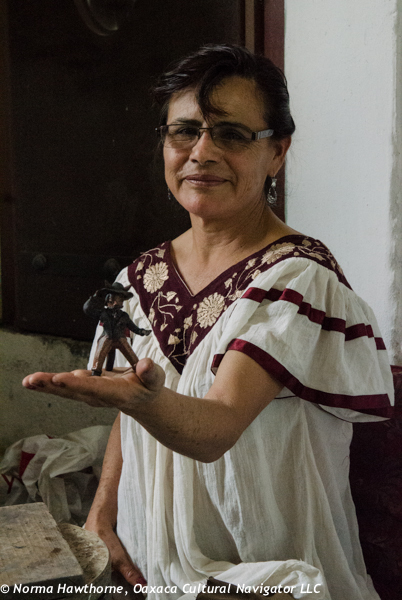 Angelica’s granddaughter, a child of about three years old, brings her tools and clay as she constructed a devil for us — one of Angelica’s favorite figures. 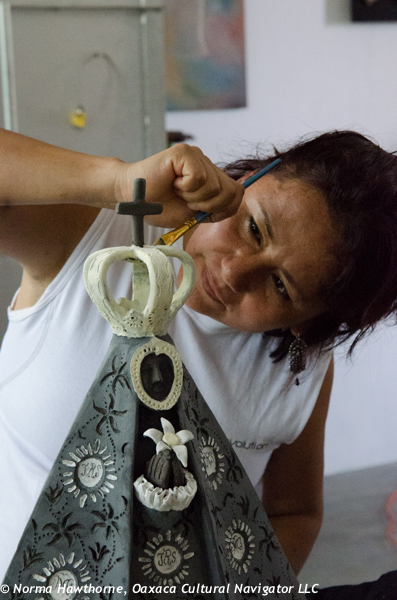 Angelica works in local clay. 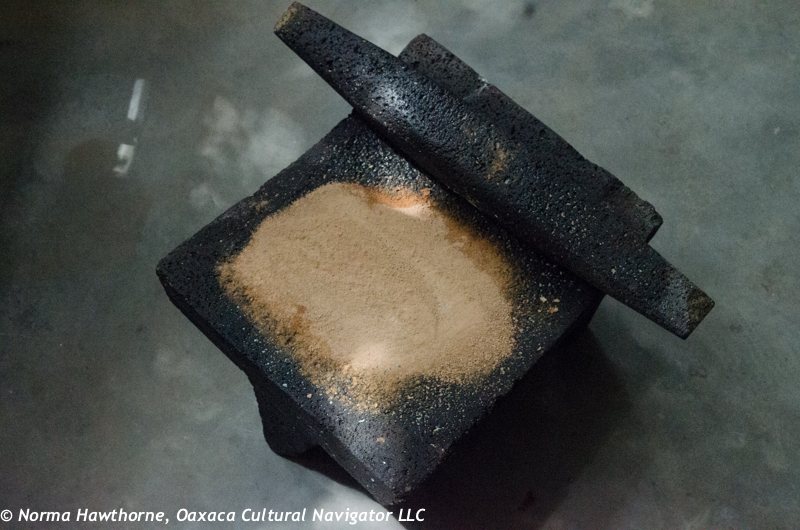 The colors that decorate the pieces come from rocks that are ground on the metate (ancient stone hand grinder) to make a powder, that is then reconstituted with water. The cookware, all lead-free, is constructed in the traditional method and is then wood-fired. A gas kiln is used to fire the more elaborate, larger figures that can be used outdoors for garden art. 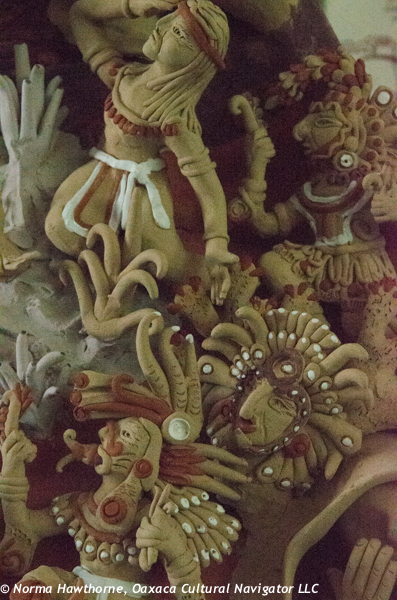 This entry was posted in Cultural Commentary, Pottery, Travel & Tourism and tagged Angelica Delfina Vasquez Cruz, clay, folk art, Mexico, Oaxaca, pottery. Bookmark the permalink.